Welcome to All Dolled Up! All Dolled Up is a team of licensed estheticians and certified makeup/airbrush artist's. We offer Bridal Makeup as well as makeup for every occasion. Lash Lifting, Brow waxing and facials are another passion we take pride in. We are honored to be doing what we love for 17 years and putting your best face forward! Come visit us at our studio or traveling to your destination is something we love to do. 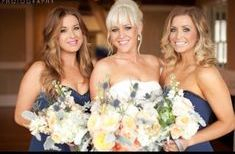 At All Dolled Up, we have a team of professionals to accommodate any size bridal party! Remember ladies... when choosing your makeup artist make sure you get a trial first. This is the day you have always dreamed of! Many pictures will be taken, memories that last a life time. Book your date at least 6 months in advance and give yourself time to refine your ideas in preparation for a bridal trial for your Big Day! To ensure your makeup lasts all day, we use only the best product. Brands like Smashbox, Bobbie Brown, Makeup Forever, M.A.C Cosmetics, Tart, Benefit and Urban Decay just to name a few. Our Airbrush is state of the art by Graphtobian Makeup. The HD (high definition) foundation is an on set favorite in the entertainment industry.